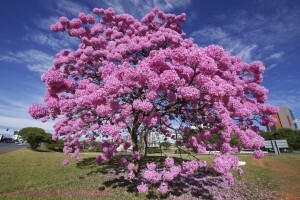 Beta-lapachone was first isolated from Tabebuia avellandedae, otherwise known as the lapacho or the Pau d’arco tree, is a large tree native to the Amazonian rainforest and tropical areas of Central and Southern America. These trees are commonly planted as ornamentals in cities, and their hard woods make excellent construction materials. The inner bark of the Pau d’arco tree has been used for centuries as an all-purpose health tonic and as medicine to treat a wide variety of different health conditions (1). In the 1960s, extracts of the Pau d’arco bark were demonstrated to have anti-cancer efficacy in laboratory studies of animals. Researchers investigated the chemical make-up of the bark extracts and discovered a large number of quinoids, and a small quantity of benzenoids and flavonoids. Further research revealed that the most active anti-cancer chemical was a naphthoquinone compound dubbed lapachol. Studies on lapachol revealed significant anti-cancer activity, but it also had significant side effects in small human trials. These side-effects deterred further research into lapachol. However, in the late 1990s, another chemical, beta-lapachone, was isolated from the Pau d’arco bark. Beta-lapachone appears to have significant anti-cancer activity just like lapachol, but without the unfortunate side effects. It also seems to have anti-microbial, anti-viral, anti-fungal, and anti-inflammatory properties. Beta-lapachone is a naphthoquinone compound. These chemicals consist of aromatic rings fused to quinone subunits. Naphthoquinone structures form the central part of many important biological compounds. For example, vitamin K has a napthoquinone structure. 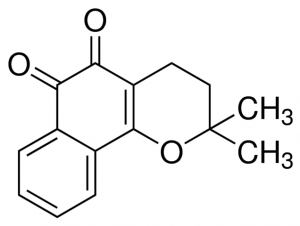 Naphthoquinone compounds synthesized by plants are commonly utilized in traditional medicines world-wide due to their potency. Beta-lapachone has two active oxygen groups fused to its two central aromatic quinone rings (2). This highly reactive structure allows the compound to react with an enzyme called NAD(P)H:quinone oxidoreductase-1 (NQO1) to produce superoxide molecules. The superoxide molecules create single-stranded breaks in DNA, ultimately leading to death of the cell. NQO1 is over-expressed in a variety of cancer cells, rendering them especially sensitive to the activity of beta-lapachone. Similar reactive processes that generate superoxides are thought to be involved in beta-lapachone’s ability to kill a wide range of bacteria, viruses, and fungi. The bioavailability and pharmokinetics of beta-lapachone has been studied in rats (3). The oral bioavailability of the compound is fairly low, only around 15%. The drug took a considerably long period of time to enter the systemic circulation after oral administration to rats. However, any beta-lapachone that entered the rat’s system was extremely stable. After 24 hours, the serum level of orally administered beta-lapachone had not decreased to any significant degree, suggesting an extremely long half-life inside the body. Beta-lapachone has been shown to inhibit the growth of many different types of cancer cells, including prostate, lung, pancreas, and head and neck cancers. It seems to act primarily by inducing apoptosis in cancer cells via the NQO1 pathway discussed above. It has also been shown to markedly inhibit the activity of the telomerase enzyme (4). During apoptosis induced by beta-lapachone, the expression levels of Bax and BCL2 are increased and the activity of caspase 3 is also increased. In cancer cells that over-express NQO1, treatment with beta-lapachone renders the cancer cells extremely sensitive to ionizing radiation (5). This effect seems to be mediated through a positive feedback loop between reactive oxygen species and the protein JNK, ultimately leading to apoptosis. These findings suggest that beta-lapachone could be used to enhance the treatment efficiency of radiation therapy for cancers. Although the anti-inflammatory properties of beta-lapachone have not been studied as extensively as its anti-cancer properties, it has been shown to have potent anti-inflammatory properties in macrophages (6). This effect seems to be mediated through NQO1 and involves activation of AMPK. Treatment of macrophages with beta-lapachone was able to reduce the expression of pro-inflammatory cytokine tumor necrosis factor-alpha and it also reduced the inflammation-associated induction of nitric oxide. Induction of nitric oxide in response to inflammation may play a key role in the development of ateriosclerosis. The safety of beta-lapachone has been incompletely investigated. One study reported no systemic side effects when a mouse model of prostate cancer was treated with beta-lapachone (7). However, a study in rats reported a possible teratogenic effect of beta-lapachone, as well as some alterations in laboratory tests (8). However, liver and kidney function did not seem to be affected by administration of high doses of beta-lapachone. Overall, the evidence seems to suggest that beta-lapachone has relatively few, if any, side effects. 4. Pharmacol Res. 2005 Jun;51(6):553-60. 5. PLoS One. 2011;6(10):e25976. doi: 10.1371/journal.pone.0025976. Epub 2011 Oct 6. 6. J Clin Biochem Nutr. 2013 Mar;52(2):106-11. doi: 10.3164/jcbn.12-80. Epub 2012 Dec 15. 7. Clin Cancer Res. 2009 Jan 1;15(1):131-9. doi: 10.1158/1078-0432.CCR-08-1691. 8. Phytother Res. 2009 Sep;23(9):1276-80. doi: 10.1002/ptr.2646.